Art Scene China was originally established in 1997 on the internet as a way for emerging Chinese artists to share their artwork with the world. Due to viewers' interest, Art Scene China grew to become a bricks-and-mortar gallery in Hong Kong in early 2000. Towards the end of 2002, Art Scene China moved to Shanghai. In Fall 2006, Art Scene China again expanded by opening a space in Beijing at 798 Dashanzi. 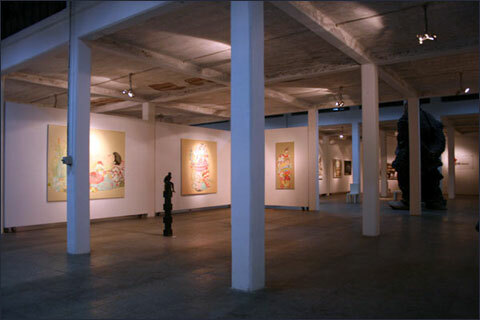 Art Scene Warehouse was one of the founding galleries of the 50 Moganshan Road (M50) Suzhou Creek art district of Shanghai. The gallery's 1,800 square metre (18,000 square feet) space at 50 Moganshan Road was a great help in popularizing the area as an "artists' district" and was one of the key elements that convinced the Shanghai government to preserve the "art warehouse area" of Shanghai. When Art Scene Warehouse first setup at M50, the district was under consideration for being torn down. Art Scene Warehouse's larges-cale events brought a lot of attention to the Moganshan Road area. The Gallery held big group exhibitions in its 1800 square metre venue aas well as large-scale events such as product launches for companies like Nokia, BMW and Adidas, as well as fashion shows, etc. At that time, people from the district government regularly visited Art Scene Warehouse as an example of what Moganshan Road could look like, and in the end, the district was preserved. Many of the artists that Art Scene Warehouse deals with are exclusive to our gallery, or galleries that we cooperate with internationally. Art Scene China always deals directly with the Chinese artists in order to insure authenticity of the work. With representatives living and travelling throughout Mainland China, we are continually on the lookout for exciting, creative and high quality emerging Chinese artists.